Jane Goodall has left an extraordinary legacy of scientific discoveries. She’s established the place of women in research and convinced so many people of the need for protecting chimpanzees and their habitat. 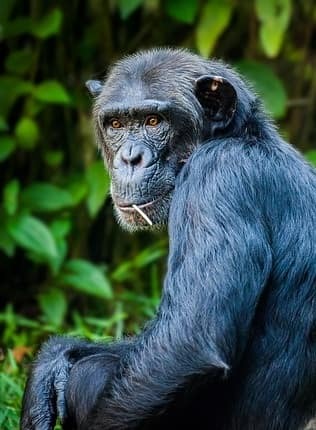 She’s old enough that she could retire in comfort, satisfied with what she has accomplished—or return to the forest to resume her observations of chimpanzees, as she has said she would love to do. There are quite a number of excellent resources to learn more about Jane Goodall and her work, including some excellent but more difficult (and LONG) articles by National Geographic, which helped fund her research. I found three other, shorter, sources I felt would be especially helpful for this newsletter. The first two links describe Goodall’s life, research, and mission. The last is optional—not so closely related, but still valuable if you’re interested in forest and wildlife protection. Voice of America has a Simple English interview with her. You can listen to the audio version and check your understanding by reading the transcript. Jane tells about her childhood dream of going to Africa to see the animals there, and the very unlikely way that dream came true—because she wouldn’t give up, but kept watching for opportunities. She had the opportunity to meet the great anthropologist Louis Leakey. He realized she had the desire and determination necessary to do the research he needed on chimpanzees—and he also wouldn’t give up until he found a source of temporary funding for that research. In the middle of the interview, she tells about the discovery that changed everything for her—and changed scientists’ perception of what makes us human. She glimpsed a chimp she knew, David Greybeard, fishing for termites by putting a blade of dry grass into a termite mound. Jane loved sharing her findings, but she planned to continue doing the research she loved most. Then she went to a conference on chimpanzees in the 1980s, and her life changed when she learned about the extent of environmental destruction and bushmeat hunting across Africa and the way chimps were being treated in labs and in zoos. As she said next, it is making a difference, though not yet enough. In her TED talk (which also has a written transcript available, as well as subtitles in 21 languages), she doesn’t discuss her life as much as she talks about chimpanzees—and the urgent need to protect the only planet we have. She explains her programs TACARE and Roots & Shoots. TACARE works to meet the needs of desperately poor villagers near Gombe. Roots & Shoots gives young people all over the world positive things they can do for their communities and the environment. Jane Goodall is doing all she can to create hope and a better future for people and for the creatures with whom we share the earth. Contrary to the expectations of many environmentalists, recent research shows native communities have done a much better job of preserving forests than their national governments. Environmental activists have worried about “the tragedy of the commons,” in which each individual will try to get a little more from jointly owned resources and not conserve them as they would their own property. Termites are ant-like insects that chimps often eat. The next issue will look at some possible innovations for a green future.